In her career debut at the NCAA Outdoor Championships, Devin Clark placed fifth in the Women's 3K Steeplechase with a time of 9:49.25. The Arkansas freshman lowered her own U.S. Junior National Record in the event, which she first set at 9:54.83 at the SEC Championships. Courtney Frerichs of the University of New Mexico won the race in 9:24.41, a new NCAA record. 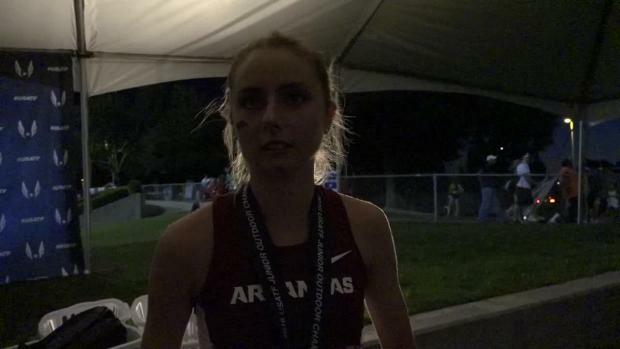 Clark's teammate, Jessica Kamilos, took runner-up honors in 9:41.28 - a new school record for the Razorbacks. #NCAATF | Frosh Devin Clark lowers American junior record for fifth place in meet debut! Clark and Kamilos' performances aided the Razorbacks to the women's first-ever NCAA outdoor team title, as they scored 72 points to clinch the win over Oregon. The Ducks scored 62 points for runner-up honors. Clark, a two-time Texas state champion for Smithson Valley High School, says she plans to compete at the USATF Jr. Nationals at the end of June and, hopefully, the U.S. Olympic Trials in July. Her new PR is just under the 9:53.00 qualifying standard to enter the Trials.